We all know the old marketing trope that > 90% of your site traffic is anonymous. So how does one covert more qualified traffic from unknown to known? While there's no magic bullet, most savvy marketers will use data-driven insights to create a contextual and value-driven website experience with a clear call-to-action (i.e. goal). To get there, the first step is to understand your audience at a deeper level - Reveal can offer those insights directly within Google Analytics. Equipped with that data, you can optimize your demand generation (ads, content, email campaigns) and site so you can generate better traffic and convert more. Included within Google Analytics are some pretty interesting audience demographics, such as Mobile sessions and Consumer Interests. This is cool but hardly tells the full story, particularly in B2B. Reveal automatically adds a deeper layer of Business data including Industry segmentation, Company size ranges, Company Tech used, and much more. What type of traffic quality is my Ad Spend driving? Where should I invest more or less money? Which pages do my best target companies spend the most time on? Is our content and site journey resonating with the average visitor? 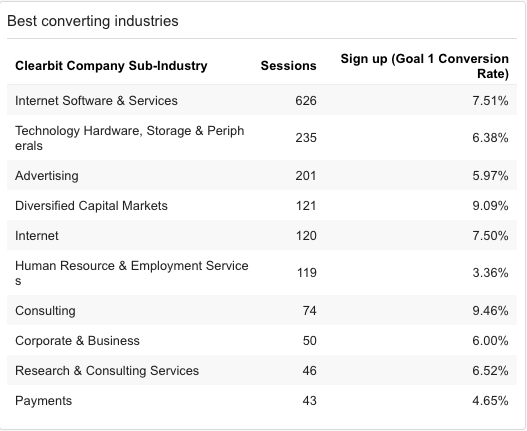 Which business segments equate to the most conversions? Let's say we wanted to create a dashboard widget showing which industries are visiting and converting (i.e. the last bullet point above). First, we'd select the tabular view. 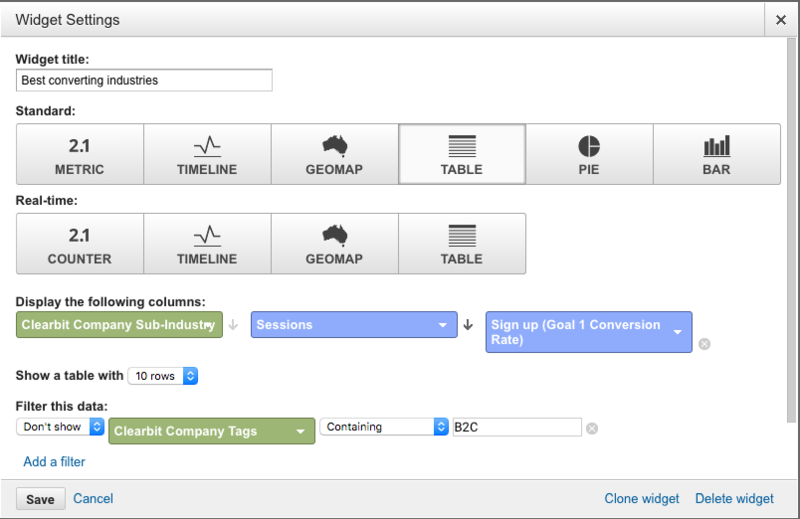 Next, we would choose the Google Analytics Goal we want to understand conversion for (ex. Trial Signups) and choose which specific metrics. In the below example, we've also chosen to exclude B2C companies to reduce noise. You can get really creative with the inclusion/exclusion criteria either in the widget or using Segments (think of Segments as global filters). Knowing that our highest traffic comes from both software and hardware Technology companies, we're going to ensure that at least one case study is available from a hardware-focused customer. Lastly, our conversion rates for Human Resources/Recruiting - another lucrative market - is low. While we can't please everyone, this is a clear indicator that our copy and signup flow is perhaps a bit too technical, and we should translate some of the technical jargon into plain business-speak. Combined with page view routes & original sources of traffic, we can get really creative with knowing exactly what traffic came from where, how successful it was, and then optimize accordingly. In the near future, Reveal will also enable end-to-end dynamic site personalization so that specific companies and segments see hyper-targeted, engaging content (ping us if you're interested in learning more). You may be asking - can't I just use Clearbit's Enrichment solution post-signup to understand my best/worst segments? While you absolutely can, the challenge is that signups skew towards your best converting segments and don't inform you as to those who have dropped off pre-signup, whereas you could still have real value to share!